Because fresh waters are optically turbid in comparison with pure sea waters, curves of photopic spectral sensitivity in freshwater fish are strongly displaced to the red part of the spectrum. For example, the maximum of spectral sensitivity in largemouth bass, Micropterus salmoides, is near 673 nm (Kawamura & Kishimoto, 2002). For eyes of freshwater fish red and orange colors are brighter than all other equipower monochromatic colors, in particular green and blue. This feature occurs in nuptial coloration of fish with location of bright red colors on the under shadowed parts of the body, in conformity with the theory of color countershading in fresh waters. However, there are as minimum two outstanding cases of nuptial coloration in freshwater fish with location af red or orange colors on the upper most illuminated parts of the fish’s body. 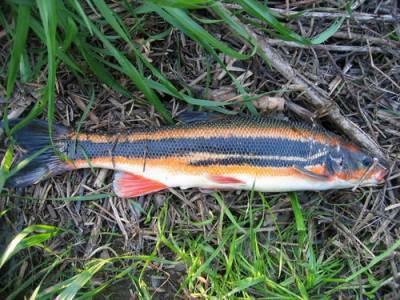 Fig.1illustrates, perhaps, one of the outstanding examples of contrast melanin and carotenoid based color patterns in freshwater fish. Bilateral longitudinal red (orange) and black (dark) stripes are basic elements of nuptial coloration in males of the anadromous Far-Eastern dace, Tribolodon brandtii (Cyprinidae), and related daces. The maximum of spectral sensitivity in T. hokonensis, adapted to the optically turbid freshwater, is shifted to the red part of the spectrum and is near 612 nm (Kawamura & Kishimoto, 2002). So, red stripes are brightest to the eyes of tribolodons, herewith dorsal stripes are located on the upper most illuminated parts of the body. Another outstanding case of bright nuptial coloration on the upper most illuminated parts of the body or even throughout the body occurs in anadromous Pacific salmons. Sockeye salmon, Oncorhynchus nerka, display the most extreme nuptial colors among other species of this genus, with the olive-green heads and conspicuous carotenoid based red bodies in both sexes but brighter in males (Foot et al., 2004). According to the same authors, in field experiments males show preferences to abstract (three ribbed) female models of red color over models of other colors in prespawning period and choose exceptionally red models during spawning. The curve of spectral sensitivity in young O. nerka is adapted to fresh water with one of the maximums at 635 nm (Flamarique & Hawryshyn, 1996), eyes of the adult fish entered fresh water must be readapted to the corresponding optical conditions. The appearance of bright dorsal colors , both visible for conspecifics and predators, in anadromous fish can be explained by the less predation pressure in fresh waters. As mentioned above, red or orange colors are determined by intensive fattening of daces and salmons on the crustacean (krill) carotenoid rich diets in the sea.